In 2005, a mysterious syndrome called rose rosette disease (RRD) was first detected in the Cranford Rose Garden. Often referred to as the witch’s-broom of roses, the disease, which is caused by an unknown pathogen, causes irregular, distorted growth, drastic decline, and eventual death of infected roses. Beyond its devastating impact, not much is known about this disease. As it began to spread through the Cranford collection, staff decided to undertake a preemptive renovation to preserve the health of uninfected roses and replace those species that had already been lost. In an effort to arrest the spread of RRD, plants with symptoms were removed, and areas with a concentration of infection were planted with species other than roses. As visitors to the Garden last year may have noticed, a bright mix of annuals and perennials grew in these fallow areas, which encouraged beneficial insect populations. The beds’ soil was also extensively amended with organic compost and manure. Restoration planting of the once-infected beds began this spring. With a focus on preserving and rehabilitating BBG’s historic collection, as well as increasing the number of modern roses on display, five sections of roses were planted in an area previously riddled with disease. These new beds feature plants collected from all over the world, organized by breeder or type, including a section of found roses and roses bred by Rudolph Geschwind, W. Kordes’ Söhne, David Austin, and early American breeders. These new roses will take three to five years to mature to their full beauty. As the renovation of the Cranford Rose Garden continues during 2011, a mixture of annuals and perennials will again be incorporated into the rose beds to provide habitat for the beneficial insects that reduce the need for chemical treatments in the garden. These companion plants also provide pleasing color combinations with the roses and cover bare spots in the beds where labor-intensive weeding would otherwise be needed. Thanks to the contributions of staff and volunteers who have worked on this renovation, the Garden has significantly improved the vigor of the collection of roses on display at BBG. 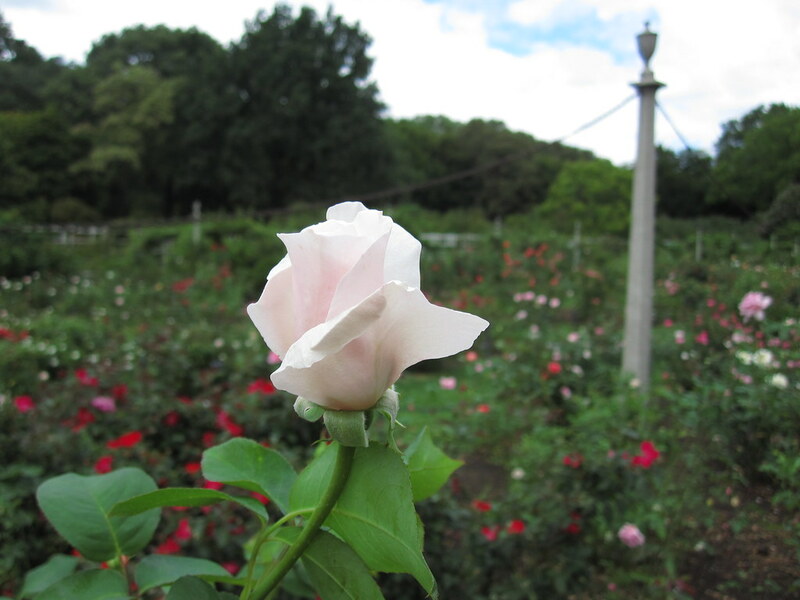 To learn more about the collection, visit Cranford Rose Garden. Sarah Owens is the owner of BK17 Bakery and the author of Sourdough, winner of the 2015 James Beard Foundation Book Award (Baking and Dessert). She was the curator of the Cranford Rose Garden and the Rose Arc Pool for six years. Jeanie: Rose rosette disease (RRD) continues to pop up in the Cranford Rose Garden. While it may never be completely eliminated, it is under control and manageable, thanks to the vigilance and hard work of the previous curator. I have seen four cases of it since the early spring and expect to see more as the season progresses. Infected plants are dug out destroyed, and we remove as much of the root material and surrounding soil as possible. As far as resistance to RRD goes, I think it may still be too early to tell with any certainty if specific varieties are less susceptible to infection. However, as time goes on I wouldn’t be surprised if disease-resistant varieties are identified. Sandra: In the world of modern garden roses, breeders are continuously developing new cultivars through hybridization. A new rose is tested for several years to make sure it has market-worthy qualities, such as beautiful flowers and/or attractive scent, disease resistance, and attractive growth habits, etc. If it is deemed satisfactory, the cultivar is named and registered and then offered to the public—or introduced. Rose rosette disease (RRD) continues to pop up in the Cranford Rose Garden. While it may never be completely eliminated, it is under control and manageable, thanks to the vigilance and hard work of the previous curator. I have seen four cases of it since the early spring and expect to see more as the season progresses. Infected plants are dug out destroyed, getting as much of the root material and surrounding soil as possible. Could you give an update on how the rose rosette disease has affected your rose garden? Have you had further outbreaks? What measures are you implementing to prevent regarding infection? Is resistance to rose rosette a myth? I am unaware of any rose immune to it. After visiting the botanic garden for the first time, I have a question. On the labels there is a reference made to the date first introduced. What does this mean? Hello, I just visited your rose garden today. What a beautiful garden and job your staff has done. However, there were lots of roses without names on it. Please help, so that the next time I visit I know the names of the roses, including the roses I can not go close to, because its planted up in the hills. Thank you much, Rose. I’m curious to learn which replacement roses have done best? Is there any possible correlation between northern-hardy or cold-loving roses and better resistance to RRD, do you think? We have it now in the Heather Garden at Fort Tryon Park in upper Manhattan. It seems to like hybrid musks very well. I think only a few roses are affected but some quite drastically. I’ve read that now we know it’s a virus spread by wild Rosa multiflora and vectored by a tiny mite. What roses have the greatest genetic distance, as it were, from R. multiflora? Must get over and visit the Cranford soon. Thanks for your work with roses! I am sorry to hear of the past problems with rose rosette disease (RRD) at the Cranford Rose Garden. I have enjoyed the garden on several occasions and have beautiful memories of the roses in the collection.The garden is such a treasure for the city and for rose lovers. So glad that you are slowly restoring the garden. I look forward to visiting again. Rosa 'Sweet Afton' in the Cranford Rose Garden. Hybrid Tea, introduced 1964. Photo by Rebecca Bullene.